Whenever a new iPad arrives, Gabriel Salgado isn’t far behind. 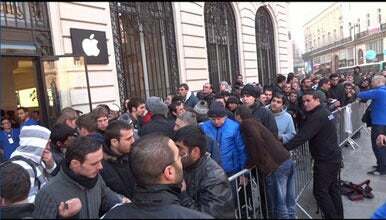 And that’s why Salgado was near the front of a line of around 100 people, waiting for the Apple Store to open its doors and unleash the third-generation iPad on a waiting world. Apple Stores across the U.S. opened at 8 a.m. local time to begin selling the latest iPad, while shoppers in nine other countries—Australia, Canada, France, Germany, Hong Kong, Japan, Singapore, Switzerland, and the UK—also got their first crack at picking up the new tablet on Friday. Picking up an iPad from Apple also gave shoppers the chance to take advantage of Apple’s free Personal Setup service, where a store employee makes sure that the iPad is entirely set-up before the customer leaves the store. That certainly seemed to appeal to Xiang Huang, who was waiting outside the Fifth Avenue Store. “I don’t know how to use a computer so I decided to wait out here,” he said. Apple’s third-generation iPad is not that much of a departure from the model it replaces, the iPad 2. Apart from being slightly thicker and a little heavier, the latest iPad is nearly identical to the iPad 2. Still, the new iPad’s marquee features—the sharper Retina display, a dramatically improved rear-facing camera, and 4G connectivity—clearly appealed to those waiting in lines at Apple Stores across the country. For Zacharius, the Army sergeant buying his iPad at the Fifth Avenue Apple Store, the Retina display and new 5-megapixel camera were the main reasons he decided to upgrade. “The iPad 2 had pretty sucky camera,” he said emphatically. Up in Cambridge, Bolton was also looking forward to a Retina display-equipped iPad and its 2048-by-1536-pixel resolution. “I thought I’d be missing out for the next year if I wait,” he said. A 30-year-old ad mobile ad company employee named Justin was braving the Cambridge line after pulling an all-nighter at a company-sponsored hackathon because the camera in the new tablet convinced him to upgrade from his original iPad. “Between the retina display and everything else, it was time to take the plunge,” he said. Jim Reimann, a 55-year-old health care consult who was in Cambridge on business, had hoped that the Siri voice-activated assistant feature would cross-over from the iPhone 4S to the iPad. However, the tablet’s new dictation capabilities convinced him to upgrade to his third iPad in as many years. 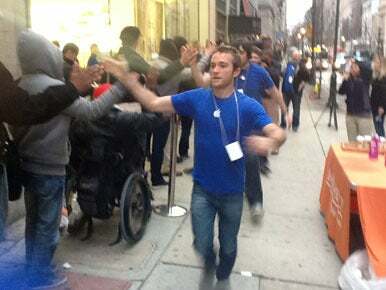 First-time iPad buyers were a common sight in the iPad queues Macworld visited on Friday. In Philadelphia, Sherri Davenport, 42, joined the line at 6 a.m., accompanied by her 12-week-old son. Davenport had recently given up her iPhone in favor of a BlackBerry—she favors keyboards over “so much touchscreen”—but decided she needed to buy her first iPad anyway. 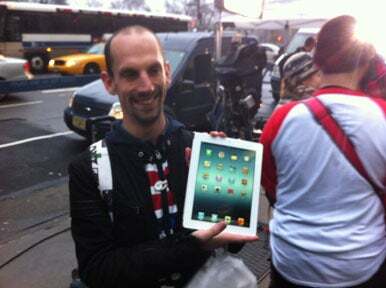 In New York, a student named Raul was buying his first iPad. “I’ve always an Apple fan, but now that Steve Jobs has passed away, I wanted to get the full Apple experience and get the latest iPad and be immersed this completely,” he said. In fact, the first person in line at the Fifth Avenue Store—retired highway maintenance worker Greg Packer—was picking up his first iPad after the Retina display and performance convinced him it was the time to buy. 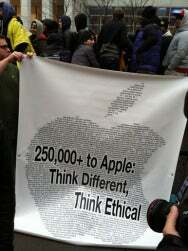 A small protest by Change.org asking Apple to use ethical manufacturing practices behind products colored the scene. The organization has been behind recent protests for Apple to address working conditions in China at factories run by companies such as Foxconn, which assembles products such as the iPad and iPhone along with devices sold by other technology companies. 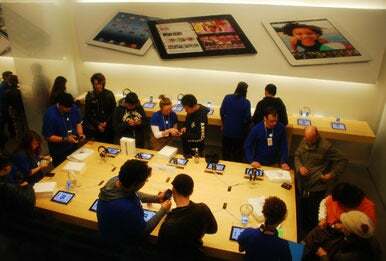 In the San Francisco Apple Store, employees help users set up their new iPads. As East Coast iPad fans were snapping up their new tablets, shoppers in the Pacific Time Zone were still waiting for the 8 a.m. opening time in front of their local Apple Stores. 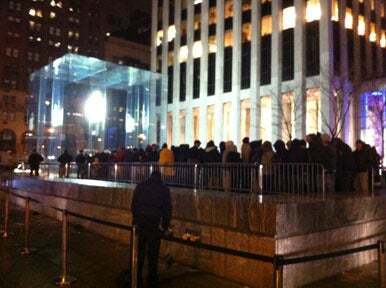 In San Francisco, wet weather didn’t deter the crowd of 150 people in line by 4 a.m. at the Apple Store on Stock Street. Also near the front of the line was Shane Slack, who was in line by 2:30 a.m. on Friday. “I decided I should show up early,” said Slack, adding that, originally, he didn’t think he wanted the new iPad but changed his mind once he watched the video of Apple’s March 8 iPad unveiling. Not everyone in the crowd was local. Mats Bjornstrom flew in from Stockholm Thursday evening in order to come to the iPad launch. He got in line around 5 am and was liveblogging the experience for his company, an Apple reseller, back in Sweden. “I’m probably one of the nut cases in line,” he said with a laugh. Across the globe in Japan, hundreds lined up in Tokyo—some for a day and a half—for a chance to buy the new iPad on Friday. At the company’s store in the upscale Ginza shopping district, dozens of blue-shirted employees counted down the final seconds to 8 a.m. local time when sales began. A phalanx of reporters several rows deep crowded the main door as the first of over 400 shoppers streamed inside to buy the device, which is priced at ¥42,800 (US$515) for the cheapest model. “It’s not that I like Apple itself so much, it’s just that Apple makes good products, so I choose them,” he said. The crowd outside the Apple Store in Ginza was in a festive mood, with people cheering as they entered the store, slapping hands with Apple staff and posing for the many photographers on hand. In France, mobile network operator Orange earlier this week promised it would begin sales of the new iPad online and at “select” stores across France. The country’s most select store, on the Champs Elysées in Paris, hosted midnight launch parties and opened early to sell previous Apple devices, but on Friday morning the store was empty and the shutter still down. The only device on display in the Window was Nokia’s bottom-of-the-range smartphone, the Lumia 710, while a massive in-store display visible behind a curtain still touted the iPad 2. Things were more animated at the Apple Store near the Opera: some customers were allowed in shortly after 8 a.m., but those left waiting in line outside were almost outnumbered by journalists, security guards and a guerilla marketing team from lekiosque.fr, whose members handed out free cups of coffee while promoting an online newsstand app for the iPad. In London, the new iPad’s higher-resolution screen was the big draw. “It is my first iPad, so I am kind of looking forward to all of it. But the display was enough to convince me to buy one,” said Mike Lee, who had decided to get the 64GB Wi-Fi version after hearing that applications would be bigger because of the increased resolution. But the improved camera and the faster processor also made the new iPad worth buying, said Amir Saeed, who had turned up at the Apple’s store on Regent Street in London. Saeed didn’t mind the weight increase, saying that it would help users notice that they actually had it with them. Joel Mathis reported from Philadelphia. Eric Bruno reported from New York. Macworld contributor Jason Tocci reported from Cambridge, Mass. Serenity Caldwell and Karissa Bell contributed to this report from San Francisco. Additional reporting from Japan by Jay Alabaster of IDG News Service. IDG News service staffers Peter Sayer in Paris, Mikael Ricknas in London, and Agam Shah and Joab Jackson in New York contributed to this story. Updated at 9:40 a.m. PT to include reports from Paris and London as well as more details from New York. Updated at 11:58 a.m. PT with video from the San Francisco Apple Store. Updated at 1:20 p.m. PT with reports from San Francisco.